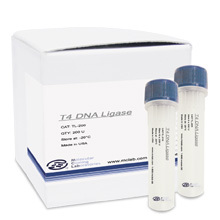 T4 RNA Ligase 1 catalyzes the ligation of a 5'-phosphoryl-terminated nucleic acid donor to a 3'-hydroxyl-terminated nucleic acid acceptor through the formation of a 3' -5' phosphodiester bond, with hydrolysis of ATP to AMP and PPi. 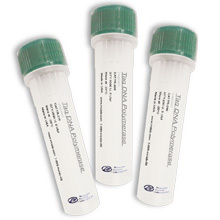 Substrates include single-stranded RNA and DNA as well as dinucleoside pyrophosphates. An E. coli strain that carries the T4 RNA Ligase 1 gene. One unit is defined as the amount of enzyme required to convert 1 nmol of 5´-[32P]rA16 into a phosphatase-resistant form in 30 minutes at 37°C. 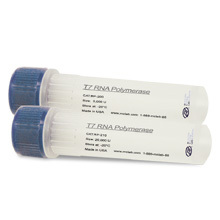 1x T4 RNA Ligase reaction buffer, supplemented with 1 mM ATP, is mixed with the RNA substrate (10µM of 5'-[32P]rA16 ) and varying amounts of enzyme. Incubation is at 37°C for 15 minutes.